Hello Friends! I hope your week is shaping up well. Mine got off with a busy start. My little family took the day off yesterday and headed to the Federal City to see the cherry blossoms. Nonetheless, work wasn’t too far off my mind. 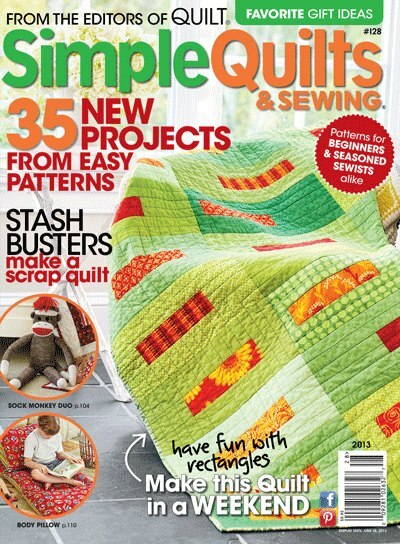 Despite the crowds that flocked to the Tidal Basin, I was able to take a few styled shots of my Stained Glass quilt that is featured in the latest Simple Quilts and Sewing issue (Spring 2013). Stained Glass is another quilt I felt that needs to be photographed outdoors, and the National Cherry Blossom Festival provided the perfect backdrop. This modifiled 4-patch quilt design is simple, but made to have a more sophisticated look with the use of many fabrics! One’s eye is drawn to the different sections of the quilt because of the colors incorporated in this quilt. 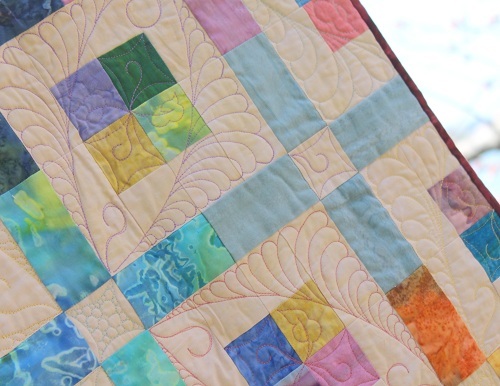 The fabrics I used for this quilt are from Benartex‘s Triple-dyed Naturescape Bali fabrics. 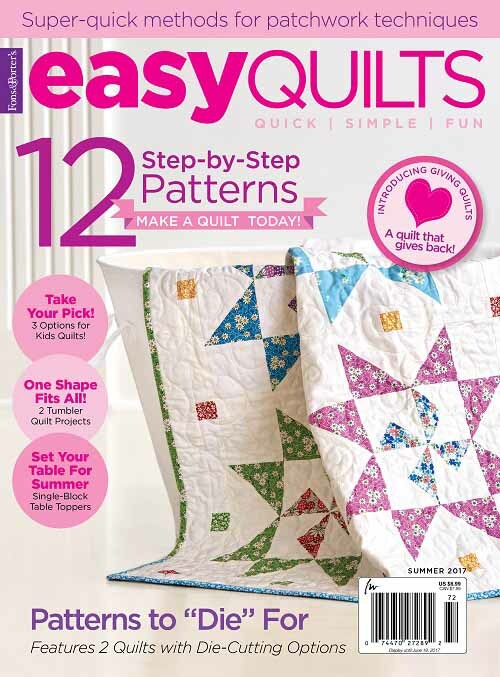 Thread Bear Fabrics (phone: 770-781-0001) is offering the kits to make this quilt for $49.99. 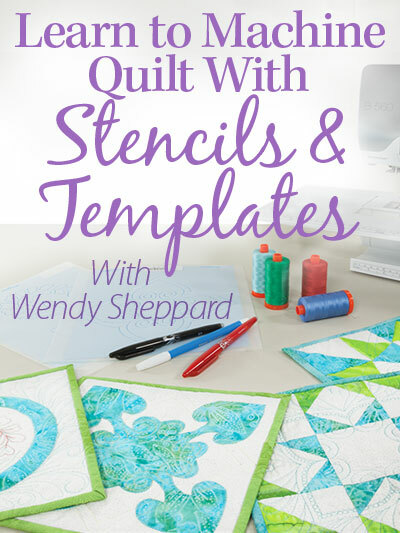 Click here to purchase the kit, or here to purchase the kit consisting twice the fabrics to make a larger quilt. 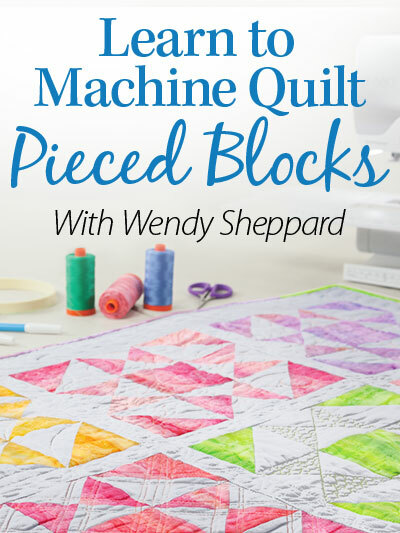 I added another design element to the overall design by using quilting motifs that were different from the geometric makeup of the block – and thus creating a secondary design using the quilting, instead of the block layout. Quilting was done with Aurifil Mako 50 threads over Hobbs Tuscany Silk Batting. Even though this is a quilt without borders, and normally I would be hesitant to do any sort of fancy quilting on border-less quilts other than straight lines… these Bali fabrics (seem to have a tighter weave) held up really well from being handled in all possible fashions when I was quilting it, and the quilt suffered almost no shape distortion after the quilting part was completed. I used different colored threads to quilt Stained Glass to match the scrappy look of the quilt top. So there are some interesting visual effects. What would I do without my little lovely assistant?! Miss Baby was most concerned my quilt would fall into the Tidal Basin when draped on the safety rail!! You might remember me smocking that dress eons ago — it’s finally finished and worn, with help from my dear friend, Annelle! Thanks for stopping by, Dear Friends. I hope you liked my Stained Glass quilt. Do tell me what you think of the quilt, and what you would do differently on a quilt like this. I am always ready to learn from you. This entry was posted in Quilt kit, Quilt Pattern, Quilting, Quilts & Projects: Published, Quilts: Pieced and tagged Benartex Triple Dyed Naturescape Balis, Simple Quilts and Sewing Spring 2013, Wendy Sheppard. Bookmark the permalink. 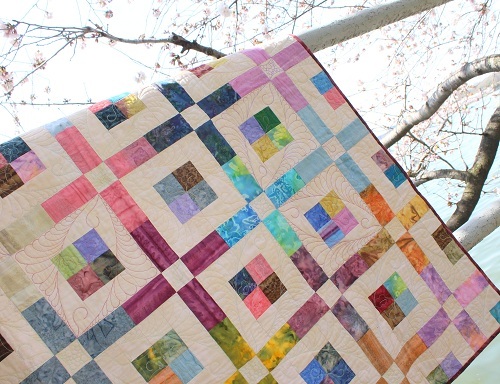 Your Stained Glass Quilt is absolutely perfect! Overall design is visually balanced and interesting, fabrics are gorgeous, and quilting is stunning. It would be a beautiful quilt anywhere, but certainly looks spectacular with the cherry blossoms and Miss Baby watching over it. Your trip looks like a lot of fun. One day I hope to see the cherry blossoms too, but in the meantime I certainly enjoy seeing them through your eyes. Thank you for sharing! Hi, love this quilt!! You don’t use Batiks much do you? The different colored threads worked great. Maybe this is the idea for my grandson’s wedding quilt & make the “Not 2 square” quilt for myself:)! 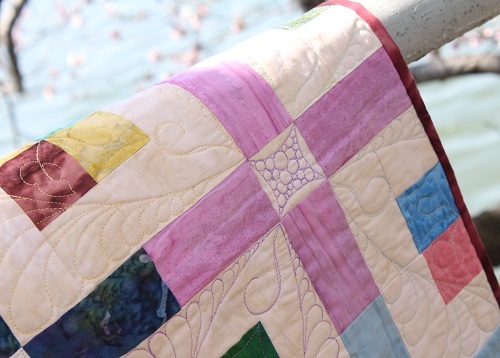 I love this quilt…it makes me want to pull my batiks off the shelf! You must really have a good head resting on your shoulders. I really like the type of content. Ever been to Montana? I’m really trying to learn more about this topic. Precisely what we were searching for. I can’t think of a thing I would do differently! It simply sparkles and shines – lovely quilt!!! That is beautiful and the backdrop for it is stunning. I really like the secondary design that comes out with the quilting. I like how well you planned and the “crosses” come out color-coordinated – did you have to sit & plan that out, or was it pretty easy to keep track of what color rectangle you needed next? I love how the feathering softened the squares and made the interesting secondary pattern – totally unexpected and pleasant surprise (to me, anyway). The cherry blossoms are really nice this year! We, too, are on a flower-finding expedition right now – viewing wildflowers in TX Hill Country – Indian Paintbrushes, bluebonnets and others. The drought’s really impacted them, but we are still finding some pretty patches! Oh, my dear Wendy. You’ve done it again! 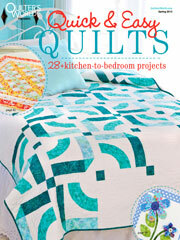 I simply LOVE this quilt and am giving serious consideration to ordering the kit. Thank you so much for sharing your talents with the rest of us. This is s delicious your work is just so amazing and would not change a thing. 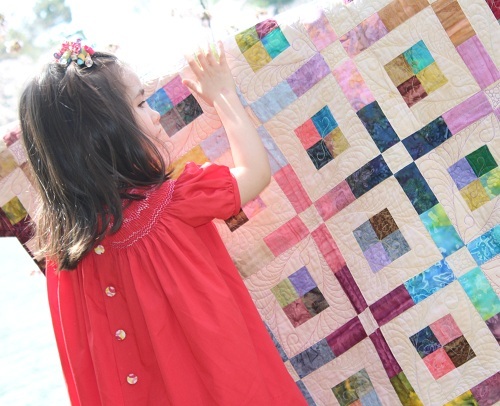 We are all blessed to see your creations from Miss Baby to your quilts one word Spectacular. You certainly found a lovely backdrop for the quilt. 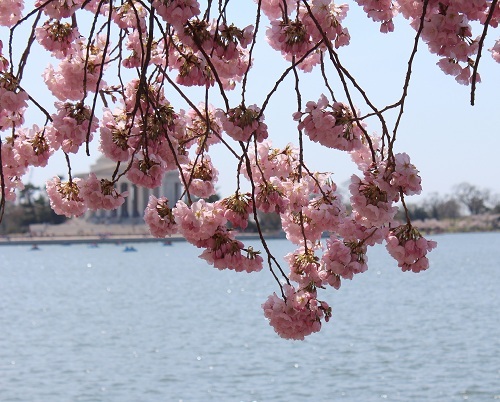 How nice that you could take in the cherry blossoms! Beautiful! It is sooooo good to see something “Spring-like”!!! Here in Wisconsin we woke up to 3 inches of snow on the ground this morning!!! I have never been to the east coast but after seeing these beautiful cherry blossoms a trip is on my bucket list. The quilt is stunning and where you photographed it is the perfect setting. Another great job of quilting. When I saw the quilt on the railing I, too, was concerned it would fall in the water. Not only was Miss Baby a great helper she was a great model as well! 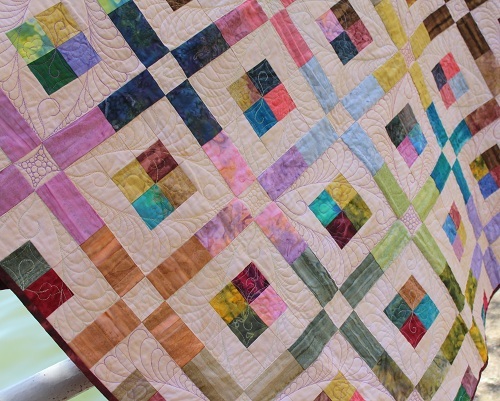 “If it ain’t broke….”…..I’d change NOTHING about the quilt…it’s absolutely perfect the way it is. 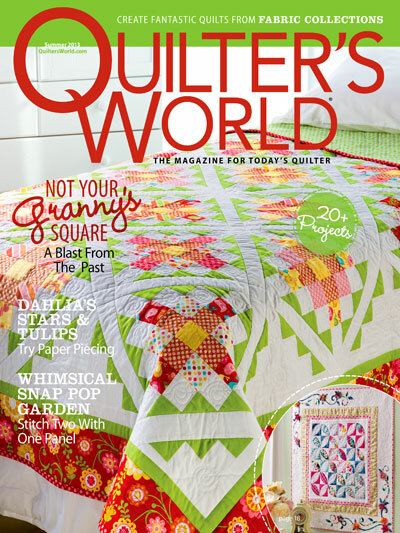 I love the quilting motif….once again your feathers are incredible. Thanks for sharing….is there no end to your creativity? Please, please keep inspiring us. Blessings…. 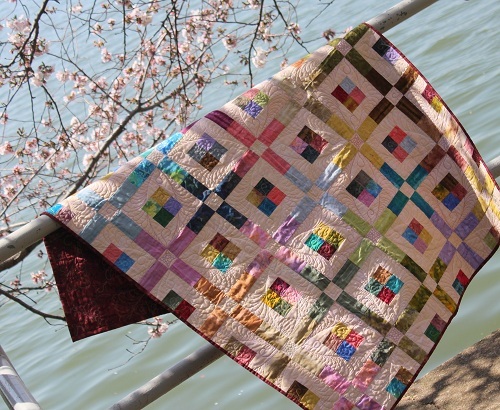 The quilt is just beautiful and the fabrics just sing of spring. Your quilting is superb. If I were to change anything, I would lightly quilt the long rectangles with a series of figure eights. Not too tight. I am going to make this quilt for sure. I just love it. Thank you for being so inspiring. BEAUTIFUL! I wouldn’t change a thing! I’m working on a batik/white background quilt this week. Giving it to a neighbor in exchange for one of her paper flower creations! She’s recreating an arrangement of my beautiful Broadway roses profusely blooming outside my window. I really love working with batiks; the colors are so rich and there is such a wonderful variety to choose from. Take enough time to get ready. I am really visiting so I can discover as much as I can on the subject so I may assist others with their questions in the future. When I browsed this post I can feel myself getting more intelligent. Looking forward to more posts from you. Your content probably saved my marriage. There is something about your artice that is rather addictive and I’d like to discover exactly what it is. That is the perfect setting to show off that beautiful quilt. I adore working with batiks — they are so wonderful to press and the colours in them are wonderful! 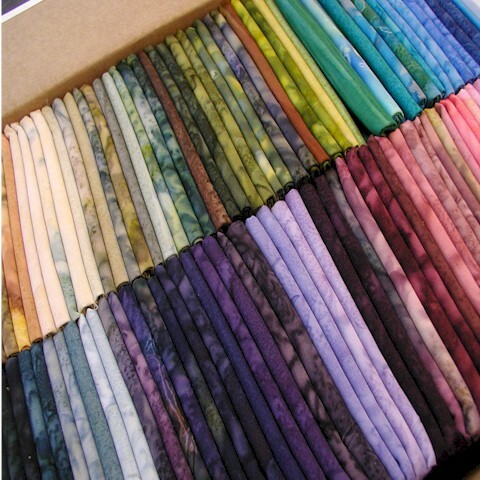 That box full of batiks has me almost drooling over my keyboard! That quilt is gorgeous! Love the different threads in the quilting. 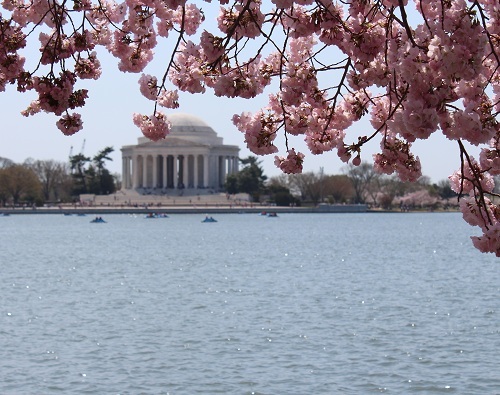 Haven’t ever been to the Cherry Blossom festival, but it looks like a beautiful sight! Such a gorgeous quilt design with those fabrics, and your quilting is as spectacular as always. 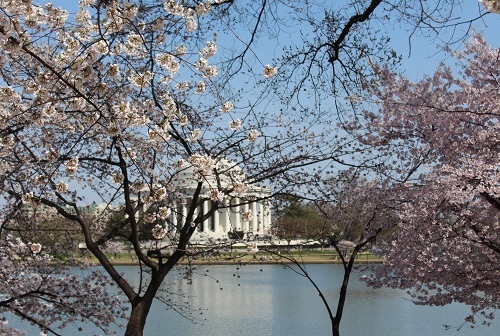 Washington DC was the ideal location for your photo shoot. Those cherry blossoms are wonderful, a site I’ve wanted to see for many years. Good for you to get to go. I love the colours, mostly pastels. And your little girl is so precious! This is such a fun departure for you, Wendy — much more contemporary than what you usually do, but just as beautiful. 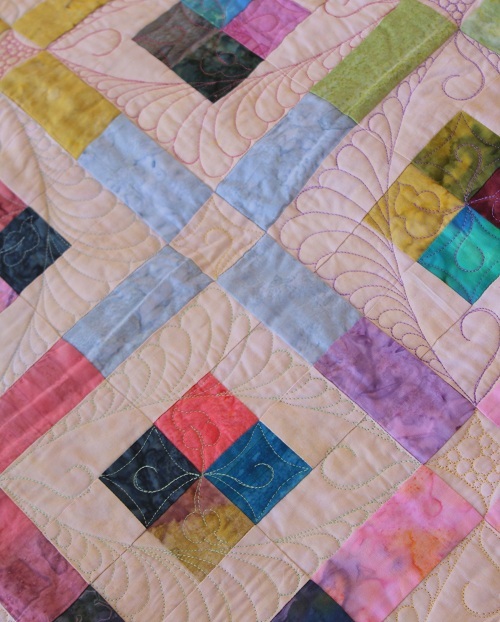 I do love the feather quilting juxtaposed with the rectangular piecing lines. 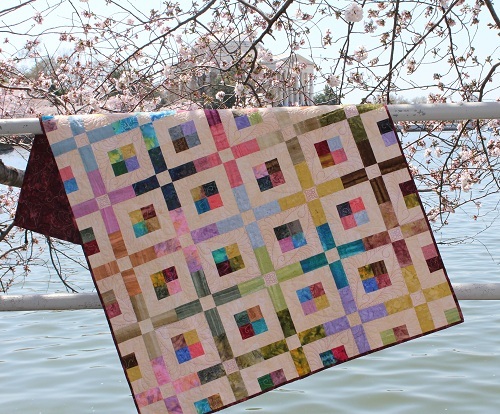 Lovely blossoms, lovely quilt, and lovely Miss Baby – how do you do it all, girl! As always, very beautiful! I van envision it in fall colors, also. God bless and thanks for your generosity in sharing so much with strangers! LOVE IT!!!! You have both excellent skills in quilting and photo-taking! beautiful colors, and love the quilting design. Perfect for Spring. I love this quilt! What wonderful photo shoot. 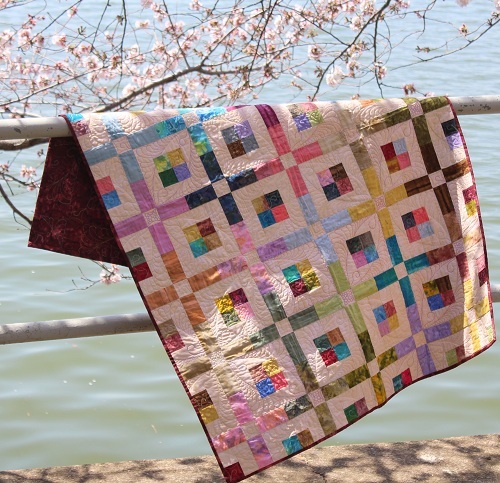 The colors of the quilt sparkle in the cherry blossoms. Love how you quilted the little hook it the points of the feather melon. So creative. Take care! I love this quilt. Reminds me of Spring! Wendy, it’s absolutely gorgeous!!! Love the variety of colors in the fabrics and quilting threads. Brilliant! Gorgeous. 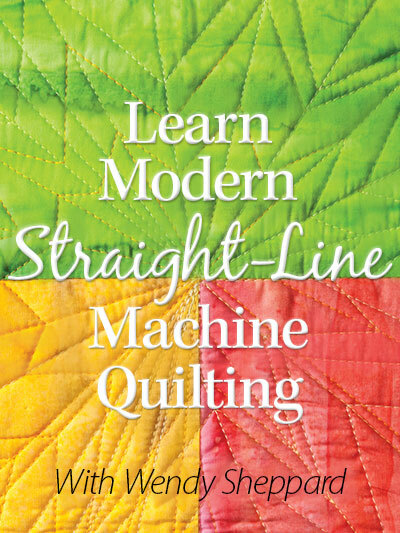 I’m hoping to make my daughter’s wedding quilt with some similar free motion quilting you show here. I am just learning how to long arm and you are inspiring to say the least. Feathers are a favorite of mine, too. Fabulous – and inspiring – thank you!!! Off to raid my batik stash right now to get started. This quilt is beautiful. I think batiks are such a versatile fabric to use in quilting. Where would I find this pattern to purchase?